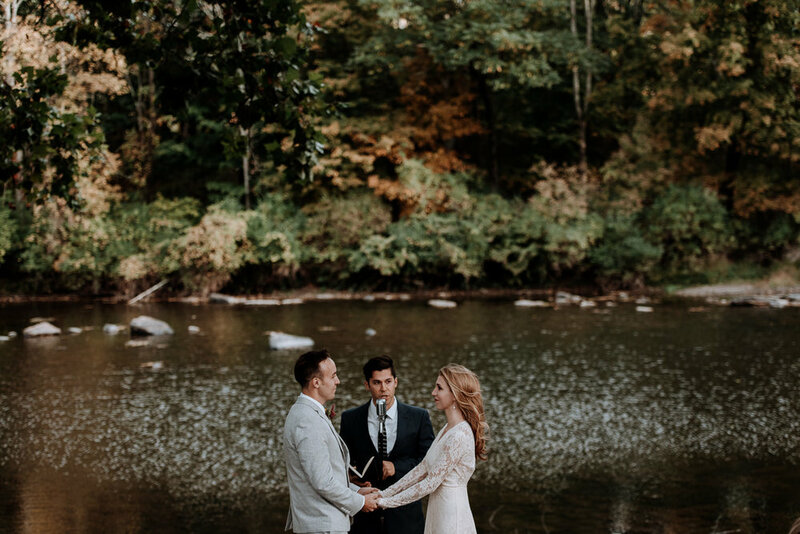 This Full Moon Resort wedding in the catskill mountains was a perfect blend of BoHo and Modern. Colleen was the most stunning bride and was a perfect blend of Boho and modern. Colleen and Anthony got married in October at the gorgeous Full Moon Resort, which is a shabby chic venue in the Catskill Mountains. They had their ceremony in the Lower Grove, which was the perfect setting. They chose Full Moon Resort, because it’s so cozy and relaxed and they just fell in love with it. It was a Boho wedding, which totally fit the venue's beautiful surroundings. I love shooting weddings at Full Moon Resort, because the surroundings are just incredible and the photo ops are absolutely amazing. The first year I started shooting weddings I had 2 at Full Moon and it's always held a special place in my heart. Colleen got ready in one of the new cabins with all of her Bridesmaids, and the atmosphere was absolutely electric. Her girls kept everything under control and kept Colleen laughing and calm. The bride then walked down the hill for the First Look. Her bridal party perched on the back porch to watch this intimate and romantic moment when Anthony saw his Bride for the first time. Anthony also got ready in one of the new cabins on the main property. Even though they had a huge wedding party, everyone was on time and very involved in making this a great experience for their friends. The couple then rode together to get to the ceremony. The wedding itself was a legal ceremony in a woodland clearing near the river. During the ceremony they read their own vows. It was so emotional. They held hands and looked into each others eye the entire time. It was really moving. The reception was in the main tent and they walked around the woods for photos in the afternoon, and did sparkler photos in the evening. The mountains that surround each Catskills Wedding venue are filled with lush greens and fall foliage everywhere you look. The rivers that run through them are gorgeous and fill the air with the calming sound of running water. They decorated the venue with flowers and lots of color, because it was an autumn wedding. The deep maroon flowers were so perfect with the Bridesmaid dresses and the Fall theme. For dinner they had proper wedding grub, which was absolutely delicious. The first dance was a romantic slow dance, and they finished off the evening with a raging after party in the Roadhouse. The funniest part of the day was when the smashed cake on each other during the cake cutting, because it gave the day a lighthearted mood. You never know how a couple is going to react to a cake smash but these two just kep laughin and kissing and never missed a beat. They also did a sparkler picture during the beginning of the reception while dinner orders were being taken and before the introductions – it was so unique! I had suggested this time of day because of the electric blue sky behind them and it was perfect~! Colleen wore a gorgeous lace dress from the Town Shop and Anthony wore a gorgeous blue suit and they looked so beautiful. Colleen’s shoes were strappy and stunning and Colleen’s flowers were weaved into a crown for her to wear to the ceremony. It was simple but made a big impact. Colleen and Anthony met in college and have been together for many years. They got in touch with me 2 years before their wedding and their inquiry was really touching. They said they wanted a relaxed photographer, and I loved that they just really wanted me there. The couple says that if you’re planning your wedding, the biggest piece of advice they could give you is to hire your vendors carefully. Put as much thought into who you hire as to what you wear because these people can make or break or your day you worked so hard on. Colleen and Anthony’s wedding was so much fun and everything I love about weddings. Here’s their gorgeous wedding! DJ: DJ Dio Presents **Loved these two.